Great competition every week right here in Santa Fe! 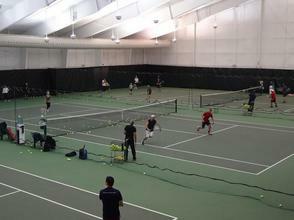 Great doubles competition is right here in Santa Fe, no need to drive an hour to ABQ. Plus, one can enjoy this competition indoors, so you never have to worry about the weather! Depending on your level come join us either on Tuesday, Wednesday, or Thursday evening. See Top Dog Doubles Flyer for more information. New sessions every 4 weeks! All of our Jr. Strokes classes are going strong with lots of future stars! Jr. Strokes teaches anywhere from the basic fundamentals all the way to strategy and mental preparation, all while having a great time with instructors and other class mates. See the Junior Strokes flyer for more information. Great way for the little ones to get started with tennis and gain hand-eye coordination, always with an emphasis on fun! See Pee-Wee Flyer for more information. The Sunday Social is a great way to have fun and exercise! Every Sunday we have 16-24 participants banging balls and having fun! The more people the more fun as it makes the levels on each court really even! Feel free to stick around afterwards and watch some football with other participants on our big screen as well. Here is the Sunday Social Flyer for more information. 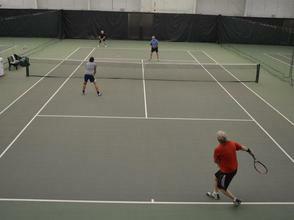 Indoor tennis - a great winter sport! 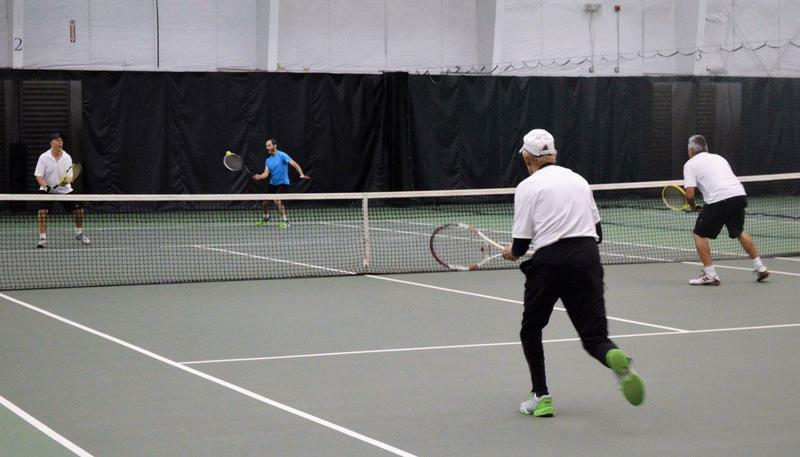 Tennis "Fun"damentals is a four week course that covers all the basics stroke mechanics and on-court strategy. 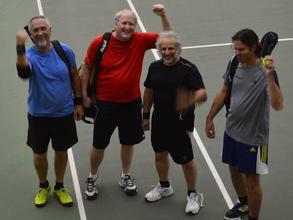 So, whether you are just starting out, getting back in the game, or play regularly, Tennis "Fun"damentals is for you. Classes are offered for beginner to advanced players. Please click on the Tennis "Fun"damentals flyer for more information. Anytime Singles is for you! The league is for singles lovers of all levels and broken down into five different divisions. This league is as flexible as leagues come since players set their matches up at times convenient for them and their opponents. For more information please see the Anytime Singles League flyer. For additional rules see the Anytime Singles Rules page. Great way to get good competition right here in Santa Fe! The Junior Singles League has 4 different divisions that range from the just starting to compete level all the way to #1 on the High School team level. Don't miss all the fun competition coming this winter. For more information take a look at the Junior League - Beginner Division and the Junior Singles League flyer. 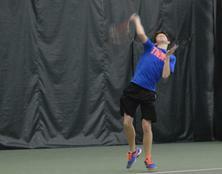 Have a fun season everyone and enjoy your indoor home matches here at Shellaberger! To see latest standings click HERE.